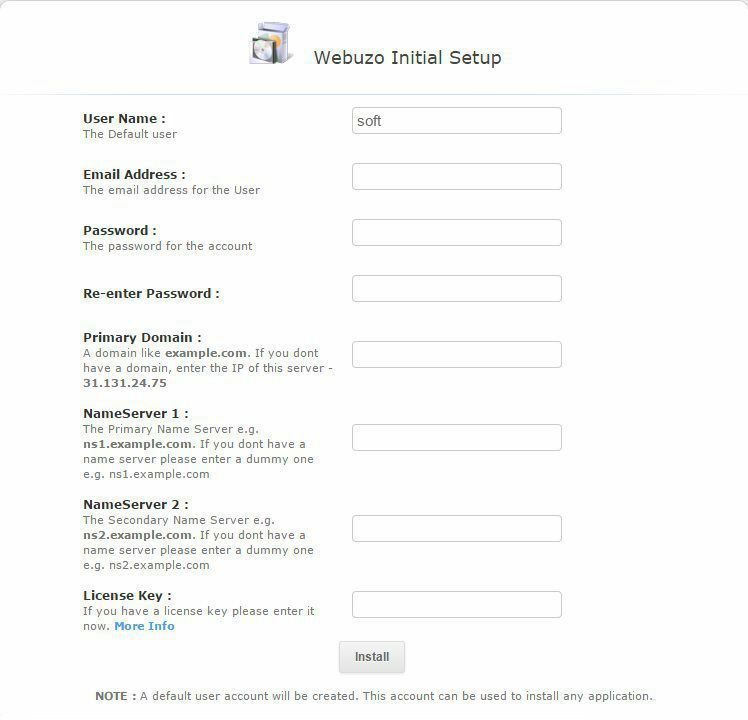 User name - enter the name of the Webuzo user. This name will be used to create the main user having rights to install all the applications. The user name is set up as "soft" by default. Email Address - enter the email address for the previously created user. 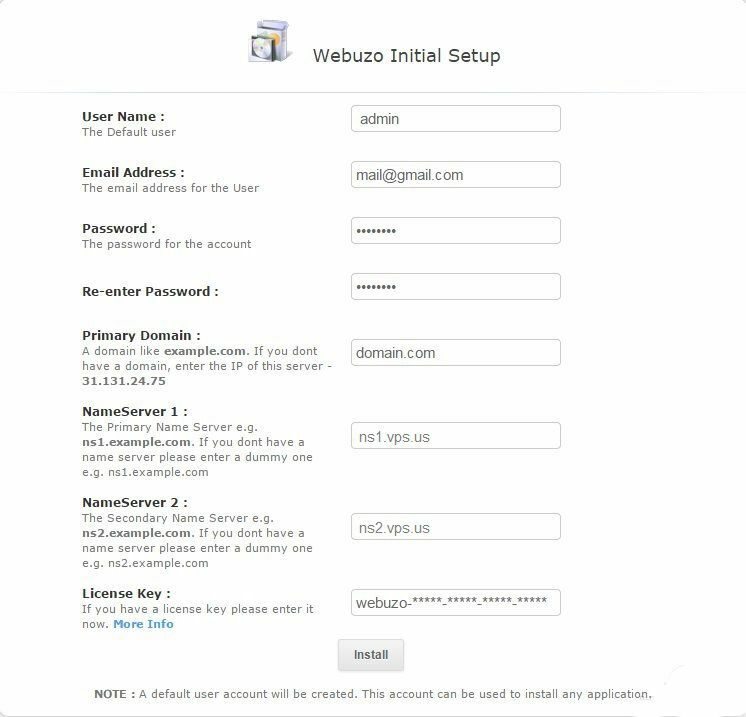 Password - enter the password for accessing Webuzo. Re-enter password - enter the password once again. Primary domain - enter a registered domain, which will be used as a main one, for example, domain.com. In case you have not registered any domains yet, you may enter the IP-address of your VPS. Nameserver 1 - specify nameserver №1, which your domain is pointed to. For example, it may be our public nameserver ns1.vps.us. In case you don't have a domain yet, you may enter any nameserver name: for example, ns1.domain.com. Nameserver 2 - specify nameserver №1, which your domain is pointed to. For example, it may be our public nameserver ns2.vps.us. In case you don't have a domain yet, you may enter any nameserver name: for example, ns2.domain.com. If you need to update Primary domain, Primary IP, Nameserver 1, Nameserver 2, it may be done in the section "Settings". License Key - enter the license key from the email with the access details to the VPS. After you enter all the necessary details, press Install. 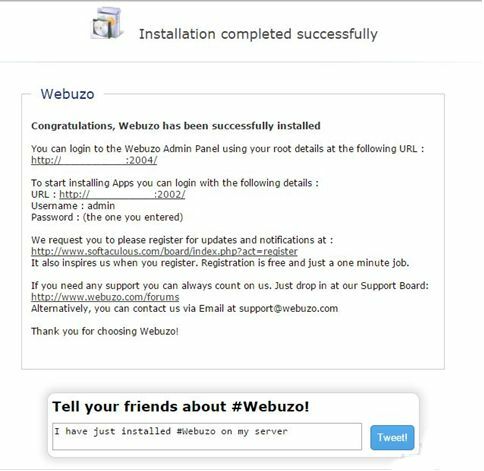 Now you can access Webuzo using the credentials specified during the initial setup. Do you need a cheap unmetered VPS? We offer OpenVZ and XEN VPS hosting at reasonable prices. You can also choose a VPS server in America or Europe.